Believe it or not, Formula One ne’er-do-wells McLaren finally, finally, finally won something. The series resurrected the F1 Raft Race for the Canadian Grand Prix, and McLaren proved once and for all that they’re the fastest at something. It was on water, but it’s something. The F1 Raft Race took place in the lake behind the paddock at the Circuit Gilles Villeneuve until the ‘90s, per Motorsport.com. 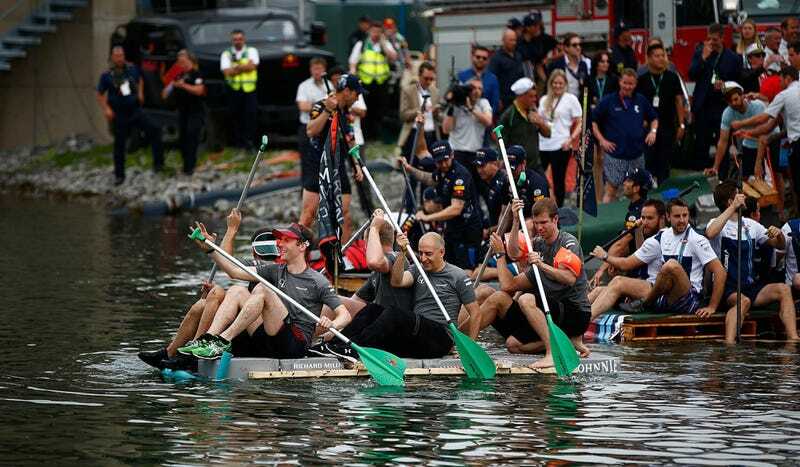 Crews used to assemble their own rafts, but the tradition fell by the wayside when F1 mechanics’ workload increased. In an effort to make F1 fun again, F1’s new Liberty Media overlords brought it back this year, only with a standardized raft design now to save time. Crews had to assemble the raft kits themselves and take their team principals along for the ride. I guess this settles once and for all: McLaren’s a competitive team if they have the same equipment as everybody else. You can watch the full F1 Raft race here on Facebook if you’d like to savor McLaren’s first win after switching back to Honda engines. Does This Win Count, Fernando?